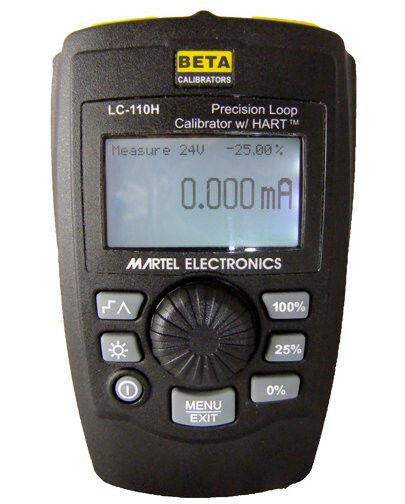 The Martel LC-110 and LC-110H are mA (loop) calibrators are the next generation of loop calibrators. The new LC-110 series features a friendly user interface with dedicated buttons and a Quick-Set Dial Knob. 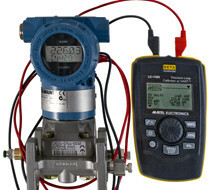 This combination dramatically reduces the time it takes to measure, or source voltage or current and power up a loop. The rugged case is contoured to easily fit a technician’s hand and the large back lit graphics LCD makes calibration in dark plant areas a breeze. The advanced LC-110H model adds HART communications and supports a select set of the HART universal and common practice commands. This unique feature allows the LC-110H to be used as both a loop calibrator and communication tool. In the communicator mode the user will be able to read basic device information, perform diagnostic tests, and trim the calibration on most HART enabled transmitters. In the past, this could only be done with a dedicated communicator, high-end multifunction calibrator costing thousands of dollars, or a laptop computer with HART modem. The LC-110H allows many more technicians to service and support HART devices. In addition to HART communications, we also gave the user the ability to download ifnromation from the LC-110H. 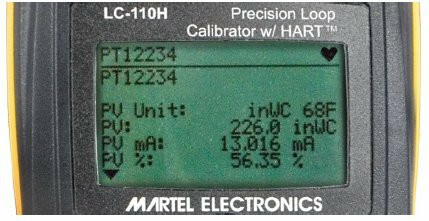 Need to quickly document the parameters of all the HART transmitters in your plant? Just add the optional BetaLOG HART software/cable to capture and upload to twenty configurations in either (.csv) or (.txt) format. Need the ability to data log or record data on a particular transmitter for troubleshooting? The optional data log tool features selectable capture interval from 1 to 60 seconds and a logging capacity of 9800 records or 99 individual sessions. 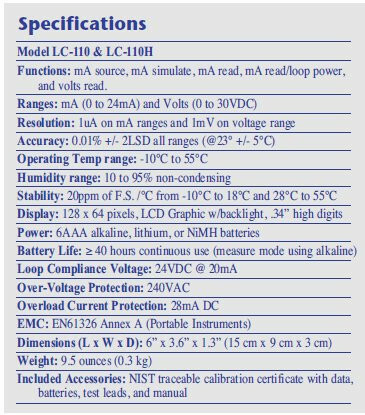 Each data sample contains the LC110H measurement, all four process variables, and the standard status conditions. The new Martel LC-110 current loop calibrator encompasses the newest in electronics technologies and ease of use. The LC-110 features an easy to use interface with quick set dial knob, thus outputing current loop levels in seconds.